Falcon Electrical Installations Ltd, are a Doncaster based company, and lying at our historical core is house re-wiring throughout the Yorkshire region. Remarkably most of the UK's housing stock (88%) was built before 1989, meaning that there are still a significant number of aged properties that will require a house re-wire. From Terraced Houses to large country properties, we are Doncaster and Yorkshire's premier electrical house rewiring contractor. Because of our experience and central Doncaster location we are able to be super competitive with our house rewiring prices; prices start from £799.00. If you are unsure if your house requires a rewire, please call or use our Contact Us page to organise a FREE appointment with no obligations or costs if you decide not to go ahead if any work is required. Home cinemas are becoming more and more popular as technology is able to deliver fantastic at home 3D Cinema experiences. Falcon Electrical Installations, Doncaster currently install controllable home cinemas with sound (acoustic) and signal DVD, Projector, Coax (TV) cabling. 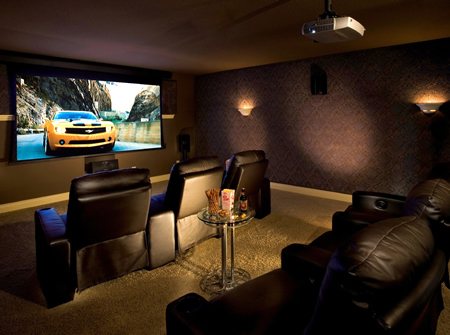 No house is too small and from loft conversions to subterranean extensions, a Home Cinema can be a fantastic addition to any home. Setting a scene in any home environment is mostly determined by the decor, but if you get the lighting wrong, you will undermine the atmospherics and possibilities of the room. Light Emitting Diodes, (LED) can replace just about any existing light, and lasts up to 50 times longer. For additional information or to have your existing solution upgraded or inspected please use our Contact Us page.